According to the New York Post, this resulted in nearly a quarter million worth of union fees being subtracted from the hands of Big Labor. 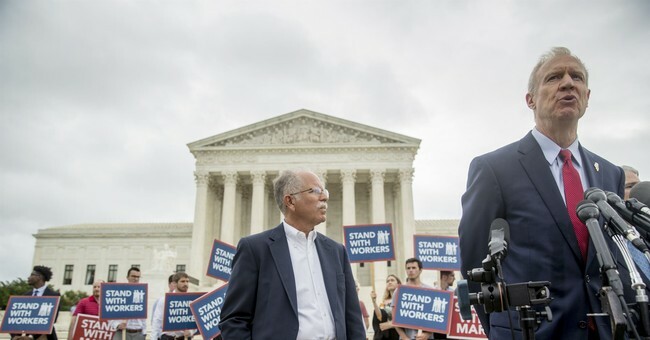 "City records show that there were 314,770 city workers paying union dues prior to the Janus v. AFSCME ruling on June 27 that found government workers can’t be forced to pay dues to unions that represent them in collective bargaining. By the first July pay period following the decision, the number dropped by 10,328 – or 3 percent – to 304,442. That cost the unions about $250,000 for that two-week period." Assisted by free legal aid from the National Right to Work Legal Defense Foundation plaintiff Mark Janus, an Illinois childcare support specialist, sued AFSCME claiming his first amendment rights were being violated by being forced to pay money towards an organization he did not agree with to speak to the government on his behalf. The High Court ruled 5-4 in his favor overturning 40 years of precedent and declaring that unions and the government cannot force individuals into unionization nor subsidizing speech with which they disagree. Critics will argue the mass exodus of workers leaving unions, but still maintaining whatever supposed benefits unions earned on their behalf are creating a "free rider" problem. But, pro-right to work individuals would assert that the only reason unions are forced to cover all employees in a bargaining unit is because union representatives often fight for monopoly representation in the first place.